The AquaSmoke 650 Dry Herb/Wax Starter Kit is made of medical grade steel and Pyrex Glass. 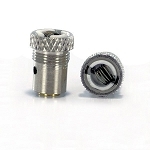 The unique design allows for you to press down on the mouth piece to rearrange the leaves without removing the tank. This helps burn all the product in the tank. The other nice feature is when you remove the tank and press down it cleans the tank for you. Three replacement heads and instructions are included in the kit. Extra replacement heads are available.